The times we’re living in are of great concern because of the current political, economic, and social global crises occurring all over the World. Our passion is to remind people that, not only does God care, but He is also present and powerful to help. Because of the current unprecedented difficulties the world now faces on a wide variety of fronts, most, if not all, people are overridden with enormous personal pressures. Because of the instability of the times, everyone is tempted to look at their own situations and to think that it is unique only to themselves and that no one except for their household and friends are going through it. The truth is that we are living in a time of global uncertainty because of widespread political and social conflict and lack of harmony. This national and international instability has led to a fearful mindset among nearly everyone, regardless of where they live. This is not only governing the minds of people in leadership positions, but also the minds of everyday people everywhere. This negative pressure is manifesting itself in the deterioration of the very fabric of civilized life. Even relationships, friendships, and family lives are being challenged and weakened. In these times, people need to have hope and faith to be strong. As we travel around the world, we find searching and seeking hearts everywhere. It doesn’t matter whether we’re speaking to a group in the Far East, Europe, Africa or America; everywhere in the world we find a common cry in the hearts of people, seeking and searching for an answer, for direction. Too often, society fails to give people the spiritual and Scriptural help they need for guidance. Our role is to bring balance by bringing the Word of God to the world. This is a very real and very dynamic message. It’s not something that is irrelevant or inapplicable. It’s not something that will weigh people down or give them yet one more thing to be fearful of or guilty about. The message of God is a message of hope, redemption, and salvation. It is the answer that people are searching for. 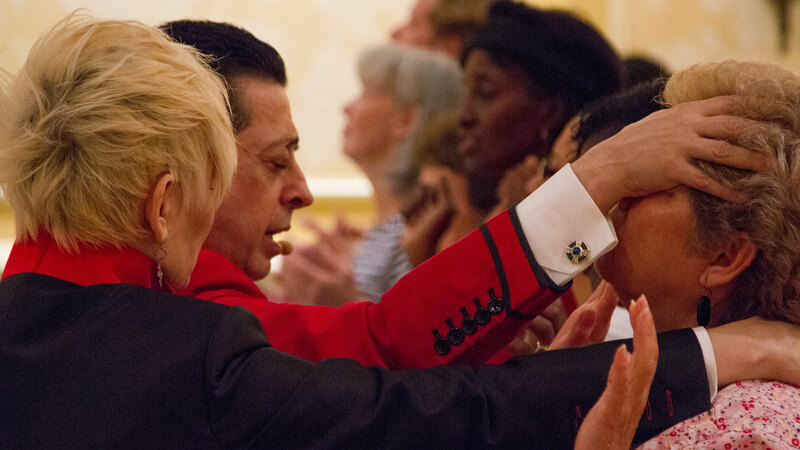 Every day, we receive prayer requests from all over the world and testimonies about their miraculous fulfillments. People need to be reminded of the love of God for each and every person living on this planet. God overlooks no one and is there for all to call upon. People can expect help in all aspects of their lives, including economically and physically, and even in their most mundane daily interactions and decisions. People have to be reminded that God is there for them. We marvel as we experience the love of people and their ability to open their hearts and receive the Word of God. 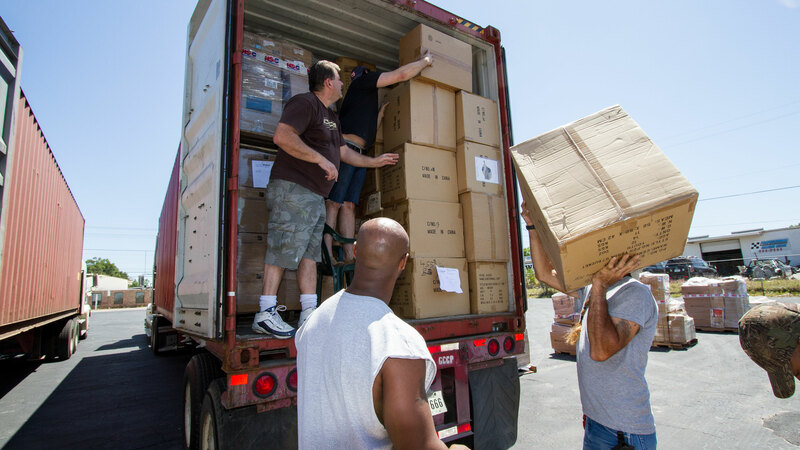 Once they have received, they share it, not only spiritually but also materially, with shoes, food, and medical equipment through the work of the ministry, to those in desperate need worldwide. This is a gift of the Spirit that we witness continuously. But the greatest gifts of all are those that come directly from God in the form of modern-day miracles that we witness and receive testimonies of every single day. Whether we are in a very intellectual setting or among spiritual groups, we have discovered that people will respond the same once we break the barriers standing between them and us and them and God. God is concerned about everyone and cares about all people. We minister to them on the level that they need and are searching for, as impressed upon us by the Spirit. In the heart of every human being is a desire for the guidance of a higher power and for miraculous intervention. That desire, however, is often opposed by the realities of natural challenges. We move to strengthen the power of God in them so they can find the answers they seek in the Word of God and from the ministry of the Holy Spirit. At the same time, we also try to fulfill their physical needs for food, clothing, medicine and the education they need for themselves and for helping others. 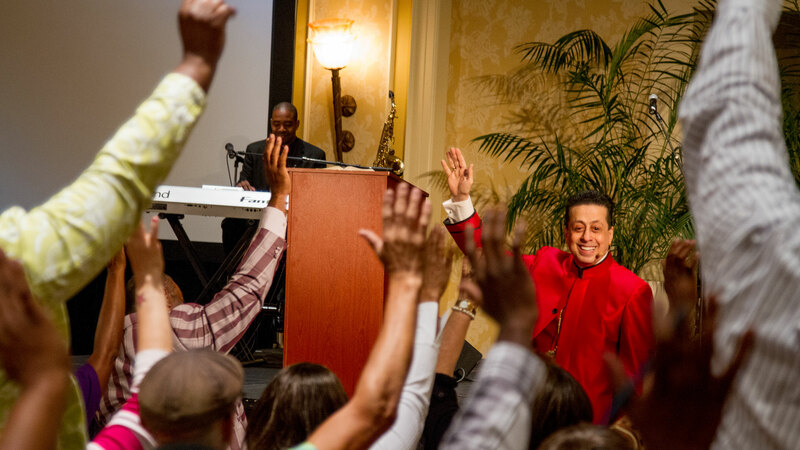 First of all, what we do when we go into an area or a country is introduce people to the power and the Word, which can include spiritual healing, physical miracles, and humanitarian outreach. This initial contact revives them and helps them to understand that God loves and cares about them. The next phase is to follow up and educate them in the Gospel through training in the Word of God. 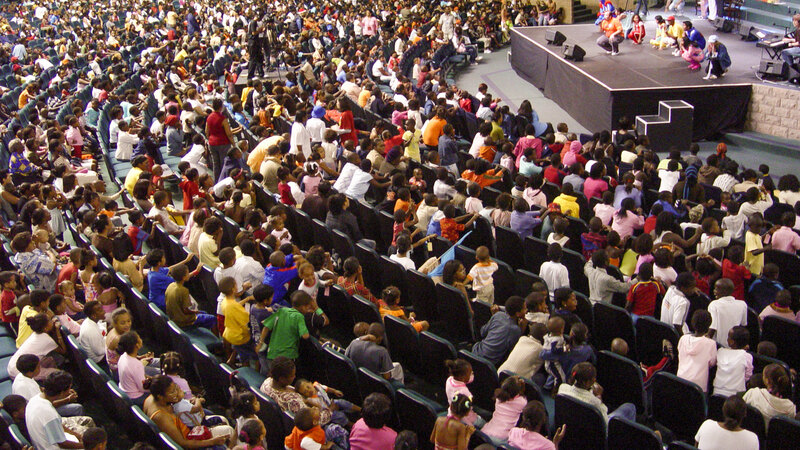 This becomes available to them through the ministry and becomes applicable to them in their daily lives. On the spirit, soul, and body level, this will keep them healed and healthy and impart to them, regardless of the nation they live in or what economic conditions they’re under. It’s a biblical mindset that, through God ideas, work, proper friendships, and fellowship, they can live happy, victorious lives. Our passion is to go to regions or areas that we’ve never been and demonstrate that the power of God is real, that His physical miracles are real, and that His love for people is real. The intent is to deliver people from negative upbringings that may include violence or abuse or lack of opportunity. But that is just a first visit, and when we leave, they might not have the support system in place that they need to continue on this proper path. So the follow-up is to educate them through resources and the teachings of the Word to get them to think Biblically with faith, with expectation, and with hope. In this way, they can deal with the tremendous challenges the entire world goes through, but differently than other people do. So if they run into something negative in their lives, instead of being broken by it, they can trust God to help them get through it and expect that something better will come along. If someone mistreats them then they know they’ve got a Helper and are able to be flexible through rough times and not to be weak. This is a two-pronged message, the first part of which is reaching them, and then the second part is teaching them. 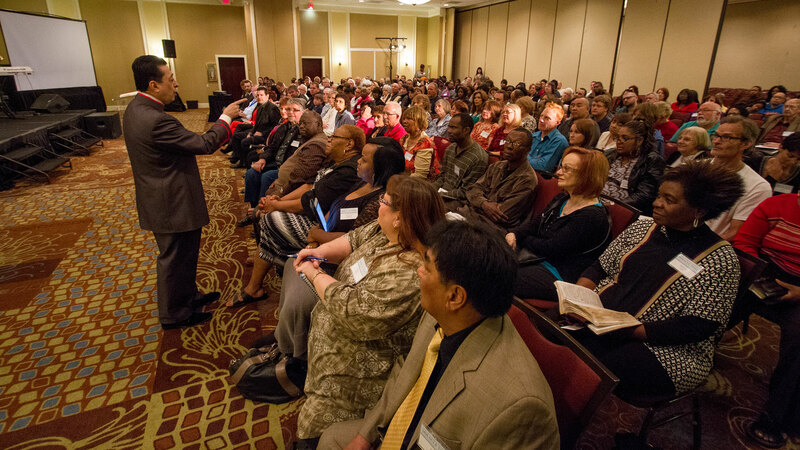 We travel all over the world, training the people of God wherever we go. Rev. 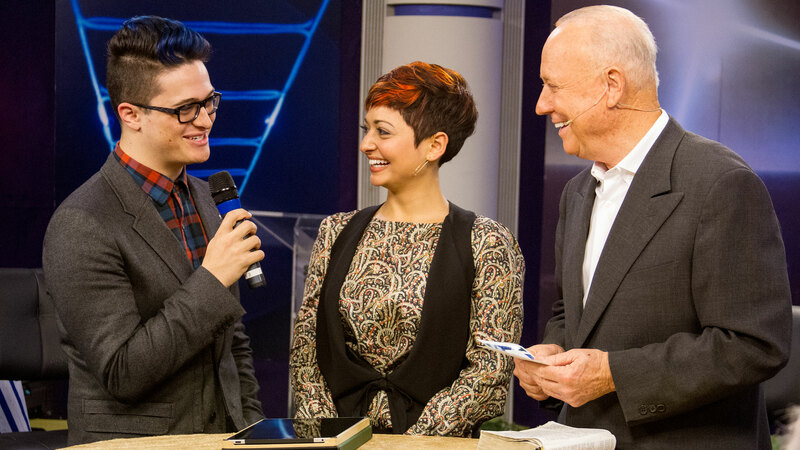 John and Christie Amira Harfouche ministering on television. To accomplish our passion, we are utilizing modern technology, including online training, sponsorships, websites, and more. What is happening is that the diplomats of different regions or countries we go to are being touched as well. We go there and do a blessing and minister to them and tell them about God’s plan of goodness for all peoples, states, and nations. When we go back again months later, we find that many of them have already started learning and are being taught. We keep our communications open to them, and we stay in touch so they know that God is taking a long-term interest in them. This has caused us to have a lot of invitations, including invitations from kings in Africa, diplomats in South America, and politicians in Trinidad. This same thing happened to us already in Guam and then also in Nigeria and in Uganda. What it does is bring every level of society together around a common denominator. Even the medical communities of these areas will tell us that they get to a point where there are some people who are beyond their help and need the help of God. The diplomats and the educational bodies that are concerned with children also pick up on this need, seeking help for those which have no help, and we start to provide assistance there as well. Step by step, we end up helping and being involved with entire nations. The longest journey begins with a single step. Our passion is to go beyond that first step and one-time touch of ministry exposure so that people can be given the spiritual tools to enable them to stand on their own two feet. We want to put them into a spiritual mindset and in touch with God on a continuing basis so they can learn and gain the means to help those around them. This spirit of expectation can then be turned into something concrete and valuable. In a time of severe challenge, instability, financial meltdown, persecution, and outright hostility, our passion is to bring the answer of hope, miracles, help and support around the world so that people from every walk of life and every age can recognize that they are loved by God and that He will provide for them.